Fancy yarn "Grass" is so unusual, interesting and positively looks even reel that to keep from purchasing it will be difficult and not very skillful craftswomen. Working with her is not so difficult, but you should remember a few rules that will help to associate high quality product. "Grass" — very interesting appearance, fancy yarn with a NAP from 0.5 to several centimeters. It is made out of polyester or nylon, sometimes with the addition of lurex or other metallic. The variety of colors, incredibly soft, silky texture — all this allows to use a yarn not only for the production of children's and adult clothing, but also for the manufacture of toys, gifts, blankets and more. The skillful use of products and their parts made of "Pot" will remind you of spring and grass, and hairy frost, and precious fur. Yarn "Grass" come for hand knitting and knitting, and crocheting, can she knit. And, it would seem that knitting should not cause any problems. First, the product of the "Grass" does not require the choice of complex patterns, neither in relief or openwork pattern will still be hidden by the pile. Knit from this yarn with needles — regular surface, the front or the reverse; hook — columns with nakida. Second, crochet should take a hook or knitting needles large size, Nos. 4 - 6, so the work will go pretty quickly. Excessive looseness of fabric fear is not necessary — thick pile will hide it all. But those who have knit "Grass", you know that pile, decorating the product, very difficult to work. In order not to spoil the yarn and not to waste time, you should remember a few simple rules. The main rule is that the pile threads during the knitting should be placed with the tips of the filaments from left to right. This is one of the main difficulties — Hanks, sales generated just the opposite, and so knitting at first glance simpler. This is so, but the quality the blade will suffer. It is necessary to rewind a skein purchased, but it's easier to pull the tip of the filament from the middle of the skein and start knitting with it — in this case, the direction will be correct. With very thick and long pile knitting has to literally "touch" you have to be very careful not to miss the loop. At first it's hard, but in the process will appear and skill, and perhaps some kind of a way to release the pile, making the fabric more fluffy. 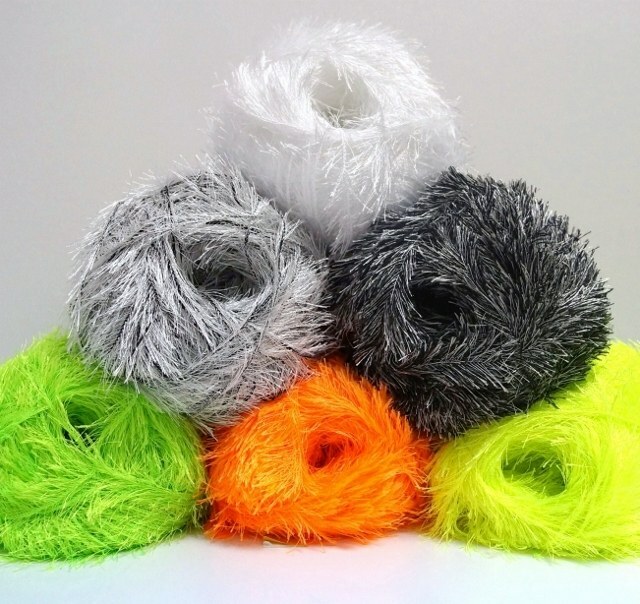 For those who want to get a more dense product, it will have strands of "Grass" to add or thick cotton thread like "Iris", or if you want a warmer item — woolen yarn. The product of only "Grass", especially associated with thick spokes, not just air and plastic, not very well keep their shape and size. But do not forget that out of yarn "Grass" you can knit not only independent of the product. Very good decoration for clothes and bound, and is made from any material. Items such as sweaters, jackets, suits, shawls related to "Grass", will transform the usual appearance of the garment.